This post is in response to Michael Bailey’s comments about the Karisma aquarelle pencils – marvellous watersoluble pencils that were so useful for sketching in all weathers as you can lay on the pencil tone and brush water across it to create lovely washes in various degrees of tone. They enabled you to create lovely, moody pencil sketches and drawings. The rough sketch on the left was done with a medium Karisma pencil many years ago. 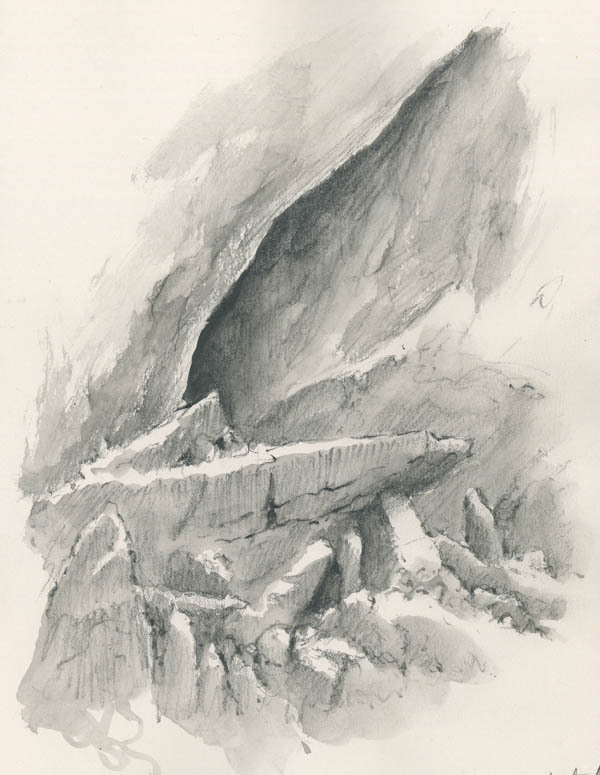 It shows an ice cave in the Argentiere glacier, with great blocks of ice fallen by the entrance, and gives a fair idea of the variety of tones you can achieve with a watersoluble graphite pencil. You can clearly see the vertical pencil hatching on the side of the large horizontal ice slab where it has not quite washed out. When the Karisma range sadly disappeared off our art-shop shelves we looked around for a replacement, and after some experiments found the Caran D’Ache Technalo range to be a good alternative. Like Karisma, the Technalo watersoluble pencils come in a range of three: HB, B and 3B, to give you a light, medium and dark tone. Thanks for your kind comments, Michael – I hope this helps. I don’t, by the way, normally use these pencils with watercolours to produce paintings as some graphite will always wash off and muddy up the colour, although I have used them as an exercise in one of my earlier books to show tone and then applied light washes to help illustrate a point. They are excellent tools for learning about tones. This entry was posted in David Bellamy, Karisma and Technalo watersoluble pencils by David Bellamy. Bookmark the permalink.